Far from the still, the sun's whitish-yellow disk it appears to be from the ground, the sun sports twisting, towering loops and swirling cyclones that reach into the solar upper atmosphere, the million-degree corona – but these cannot be seen in visible light. Then, in the 1950s, we got our first glimpse of this balletic solar material, which emits light only in wavelengths invisible to our eyes. We can observe the shape of the magnetic fields above the sun's surface because they guide the motion of that plasma – the loops and towers of material in the corona glow brightly in EUV images. Additionally, the footpoints on the sun's surface, or photosphere, of these magnetic loops can be more precisely measured using an instrument called a magnetograph, which measures the strength and direction of magnetic fields. Next, scientists turn to models. They combine their observations – measurements of the magnetic field strength and direction on the solar surface – with an understanding of how solar material moves and magnetism to fill in the gaps. Simulations such as the Potential Field Source Surface, or PFSS, model – shown in the accompanying video – can help illustrate exactly how magnetic fields undulate around the sun. Models like PFSS can give us a good idea of what the solar magnetic field looks like in the sun's corona and even on the sun's far side. 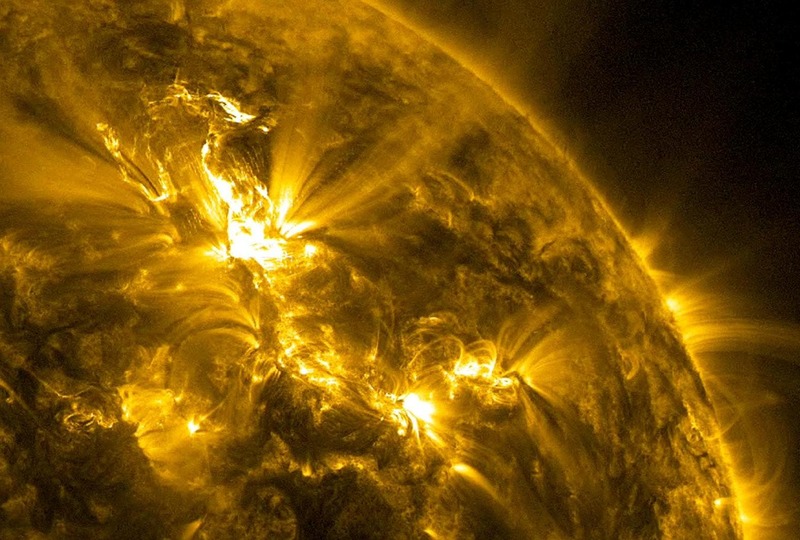 A complete understanding of the sun's magnetic field – including knowing exactly how it's generated and its structure deep inside the sun – is not yet mapped out, but scientists do know quite a bit. For one thing, the solar magnetic system is known to drive the approximately-11-year activity cycle on the sun. With every eruption, the sun's magnetic field smooths out slightly until it reaches its simplest state. At that point the sun experiences what's known as solar minimum, when solar explosions are least frequent. From that point, the sun's magnetic field grows more complicated over time until it peaks at solar maximum, some 11 years after the previous solar maximum. "At solar maximum, the magnetic field has a very complicated shape with lots of small structures throughout – these are the active regions we see," said Pesnell. "At solar minimum, the field is weaker and concentrated at the poles. It's a very smooth structure that doesn't form sunspots." NASA: "X-Rays Light Up Sun-Like Coronas of Black Holes"